Amar Sindhu talks to Zulfiqar Shah about the contemporary outlook of the women’s movement in Sindh, and how gender is placed within a larger rights movement of the oppressedHas urbanisation and socio-economic development contributed positively to the women rights situation in Sindh? The process of urbanization is unplanned, unorganized and unconscious; therefore it doesn’t influence the women rights situation as such. Basically, collective social structure influences the overall women rights scene here. The credit of the contemporary scene goes to education, access to information and exposure to professional life and the world outside. This has helped Sindhi women to develop their own worldview about society and politics, including their rights and violation of these rights. Therefore, new opportunities have opened up in that context for a relatively backward rural society to come ahead, along with the developed urban women. This is the time when we need to connect women’s rights to human necessities. Honor killings, selling women, and extreme form of labour are the worst faces of gender-based violence in Sindh, specifically in the rural north. This is due to the political economy of these areas, and the power nexus of rural society, which has been made more tribal than ever before by making the state apparatus invisible. There are many economic factors, particularly property, that leads tribal communities to honor killings, selling girls and forced marriages. The perception for women to become identical to a man’s honor has turned her into the virtual commodity. According to the Paulo Frère, the struggle cannot always go on in the same frame. It’s a process of gradual development. There is an issue of discourse within political movements. Activism supports theory, and vice versa. Both are gradual in their process, and are interchangeable. If the formation of theory is not reflected by activism and vice versa, then certainly, there are essential gaps in higher concepts, strategic planning and the struggle itself. The real women rights movements can only grow through people’s movements. We want a parallel women movement going along with the other rights movements. It must challenge the various forms of operations, including national and class. We have always focused the legal framework for women’s rights; this is the time when we need to connect the personal or individual issues of women with the collective and legal or legislative reforms. 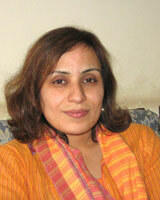 Pakistan literature today is isolated from people’s issues. There is a gradual decline in the role and approach of literature for depicting, portraying and focusing the people’s real issues. Even in Sindh, it has encountered a decline. There is a role of progressive literature in the social movements of Sindh that the majority of the activists and organizations including all forms of nationalists are secular and liberals in their essence in comparison with the other provinces. This is visible especially in the context of fundamentalism. Secularism is the foundational element of Sindhi literature. There is no reactionary writer in Sindh who has become popular. However, a reality we need to appreciate is that in the post 1980s scenario, there is a declining trend in Sindhi literature for social realism. Today, Sindhi literature doesn’t represent contemporary Sindhi society. How do you analyse the state with respect to women’s rights?